The problem with being good at things is that we can be fooled into thinking these things are our gifts. I used to think my gifts were the things that I was really good at, without having to put as much effort into them as others. For example, I was always good at math without needing to study. So, I concluded in my high school years that math was one of my gifts. Then, in college, clueless about what major to choose and overwhelmed by all of the options, I became an accounting major because I was good with numbers. I didn’t really enjoy accounting, so the major only lasted for a semester. And, I remember feeling discouraged and confused by the realization that I didn’t like what I was good at. Shouldn’t enjoyment be the natural response to easy success? Frustrated with this gap between excelling at something and enjoying it, I set out to find my true gift. I adopted a two-pronged approach as I decided that my gift must be something that 1) I could excel at with ease and 2) I naturally enjoyed. But, I kept experiencing the excel-enjoy gap. During my brief stint as an art major, I learned that creating art brought me great pleasure. But I wasn’t very good at it. When I swung to the opposite pole and became a computer science major, my grades were good but I spent an entire semester in late-night computer lab misery. Four college majors, countless personality/career assessment tests and dozens of self-help books later, I was still trying to find my gifts. I decided that my two pronged approach to gifts must be missing something: a spiritual twist. So, I added a third prong: Gifts must be something that can be used to help others, do good and create positive change in the world. 1) Gifts are things that you good at with little effort. 2) Gifts are things you enjoy doing. 3) Gifts must be needed by the world. I believed in these three things for a long time. They motivated me to become a physical therapist. They drove me to advance in my career. I preached this definition of gifts to my two daughters, and encouraged friends and colleagues to cultivate their gifts based on this three pronged approach. Then I realized something: Most of the time, when I was using what I thought were my gifts, I didn’t need God. When we excel at something with little effort, derive great satisfaction from it and are fulfilled through helping others, we can go it alone. We don’t need to depend on God. 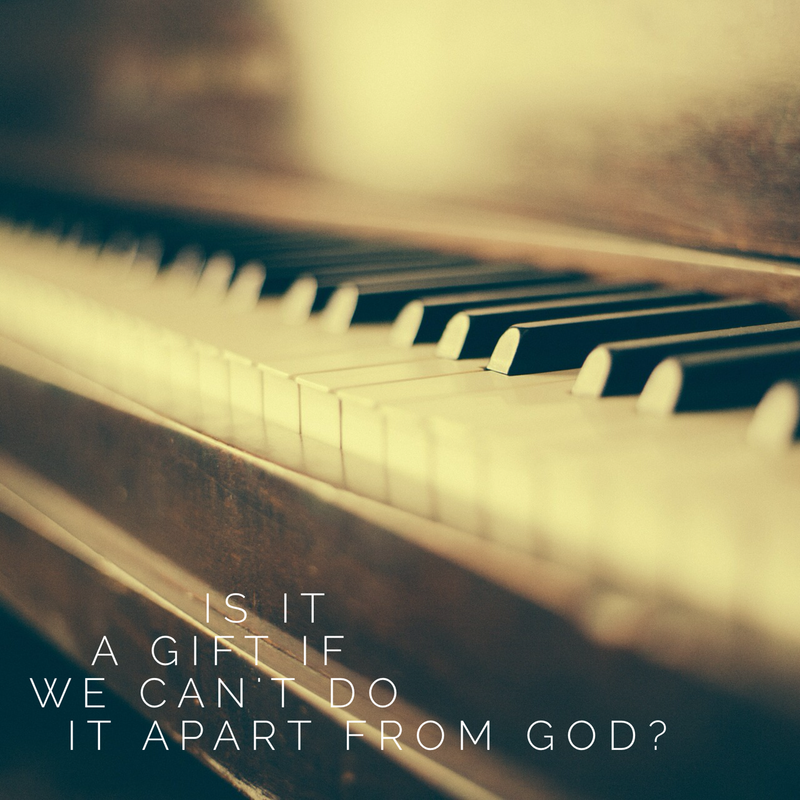 How can it be a gift if we can do it apart from God? When I started writing, my three point definition of a gift was further challenged. When I write, I feel like a vessel. There is a force outside of myself, which I believe to be God, working through me. The supposed muse is palpable. I am humbled to my core by the process because I know I can’t do it alone. I don’t think writing meets my three criteria to be considered a gift, but I know that I am supposed to do it. I know I need God to do it. And, because of this, I believe it will be used to help others. What if a gift is that thing we do that makes us humble? What if gifts require our dependence on God? What if they are not meant to be something we can do completely on our own? If we don’t have to tap into God and let Him flow through us to do what we are good at, then maybe it is not really our gift. If we are powered completely by our own engine, able to keep on racing and winning without needing God, then aren’t we limiting ourselves? We can only live up to our full divine potential if we stretch ourselves to need to depend on Him. I am trying out some new definitions of gifts these days. I am not sure that gifts have to be things that come easy to us. I am not even convinced that we have to fully enjoy them. But, I am becoming convinced that our gifts should make us humble. If you think you know what your gifts are, challenge yourself with the question of humility. Can you do what you are good at on your own? What if you stretched yourself, with these gifts or new ones, to work in that space between “J.J.” and “SDG”? And, if you’ve spent a chunk of your life trying to figure out what your gifts are (like me), give these new definitions a try. You just might be able to avoid having a problem with being good at things. Do you have a natural talent that you pursued but never loved? Or have you discovered how to use your gifts in partnership with God? Leave a comment below and tell us your story. Bio: Holly Pennington is a writer, mom, physical therapist and entrepreneur living in the Seattle area. She is currently working in that space between “J.J” and “SDG” as she writes at www.dreadlocksandgoldilocks.com and starts a new business. She can be reached on Facebook (dreadlocksandgoldilocks) and Twitter @dreadsandgoldi. Want to be my guest too? I’m looking for writers with an authentic voice who can share their struggles and insights on purpose, parenthood and the life following Jesus. Check out submission guidelines here. If you’re not a writer, but want to continue the honest conversation on hope and calling and life in between, subscribe here, and I will send you my two eBooks free. You can only get them when you subscribe so be sure to take a moment and sign up. Thanks for reading.